4Life® Transfer Factor Performance & Show includes the nutrients today’s horses need for competitive events and work activities. It combines the advantage of balanced, comprehensive nutrition with the patented immune system support of Transfer Factor Plus®; making it a complete, one-step nutrition source for improved joint health and flexibility, more energy, healthier coats, stronger bones and superior immune strength. 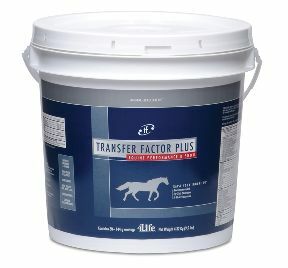 Formulated in cooperation with top veterinarians and animal nutritionists, Transfer Factor Performance & Show helps ensure superior health for horses throughout all stages of life.